On December 21st, IOST officially released the Node Application Handbook and opened up applications to become Candidate Nodes for the launch of the IOST mainnet in February. 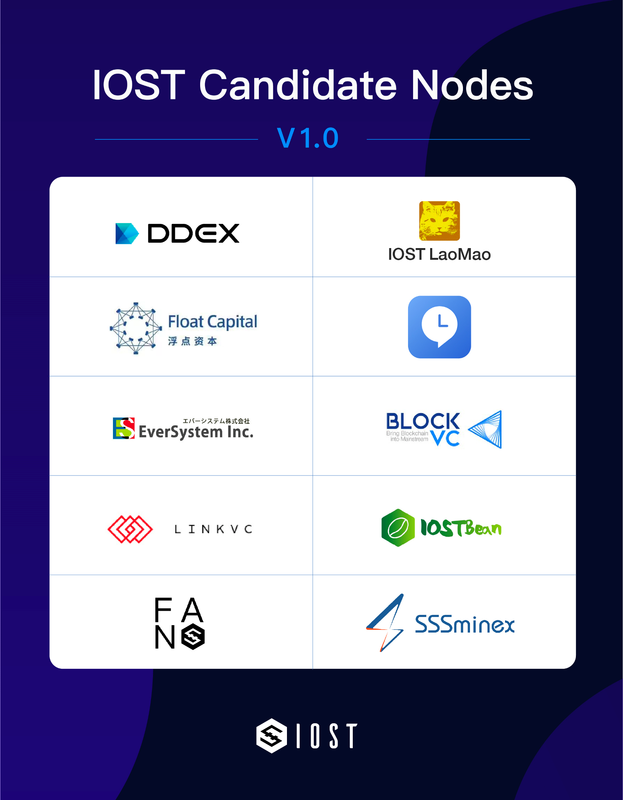 In just one week, more than 100 global institutions, investors, blockchain communities, developer teams, exchanges and others submitted Candidate Node applications, hoping to participate in the election campaign and to become part of the IOST ecosystem. At the same time, we have had a great response from community members who are actively involved in the process and have recommended many valuable node candidates. The IOST team is very grateful to everyone for their recognition and support of the IOST ecosystem. In the next two months, we will continue to share the Candidate Node campaign progress to the community and share more updates and developments. At present, we are carefully reviewing all current Candidate Node applications and communicating with Node Candidates. Going forward, we will announce the approved candidates who have passed the review stage and bring a series of interviews, reports and profiles of the node candidates to the community. Today, we are pleased to introduce 10 of the initial approved candidates from a variety of countries and backgrounds. DDEX is one of the largest decentralized exchanges on the Ethereum network, with 25% of the total decentralized transactions. It is also the first decentralized exchange based on Hydro protocol technology, providing users with a high-quality trading experience through a real-time chain-linking mechanism and a secure chain-based settlement mechanism. As the largest decentralized exchange on Ethereum, we will work with IOST to create a secure and open trading platform for token transactions in the IOST ecosystem. Lao Mao is a well-known investor in blockchain and cryptocurrency projects and started investing in Bitcoin in 2013. He has served as YUNBI COO, ICOINFO CEO, INB Partner, and BigONE CEO. He was an early investor and evangelist of ETH, established one of the industry’s largest crypto communities and released a series of blockchain 101 lectures. He was also an early investor and evangelist for EOS and independent researcher in the global blockchain industry. I hope that IOST can become a stable blockchain platform and its DApp ecosystem will prosper. Community governance is a brand new practice, and I hope that IOST can embark on a path of governance that meets its own needs. We will continue to invest in the IOST ecosystem, leveraging our strengths in DApp development and enriching the DApp ecosystem of IOST. At the same time, we also aim to provide stable node services to ensure IOST network stability and security. The community originates from the original crypto circles started several years ago. The team has weathered ups and downs of cryptocurrency from the beginning and has regularly outperformed their competitors. As a long term planner for running an IOST node, Float Capita has participated in the early investment of IOST and the ecosystem. Looking at the ups and downs of the currencies price, they have never shifted focus, as they firmly believe that IOST will have a greater future. Blockchain is the future, and IOST will certainly occupy a place in the competition of the public networks. 3 O’Clock is an open platform ecosystem focusing on the blockchain field. It has a complete mining incentive ecosystem, supports digital wallets and small apps. They aggregate high-quality partners in the blockchain industry, and are committed to building the first platform for a blockchain community exchange. 3 O’Clock, which originated from the blockchain community, has got to where it is today through establishment and development. I hope that everyone will continue to support 3 O’Clock. We will build a safer, more reliable, open, fair and fun ecosystem for everyone. MEET IOST is the largest IOST community in Japan. It was born in the Ever System company, a well-known blockchain development and consulting organization in Japan. Ever System is also a well-known blockchain game development team. They developed a game called “Encryption Ninja” on the Ethereum network in early June 2018. The team has deep DApp development experience and will provide education and training resources for blockchain and DAPP developers in Japan. MEET IOST believes that a great platform depends on how many people trust it. And IOST can prove your ability to the world. BlockVC is one of the world’s leading blockchain venture capital firm, focusing on investing in start-ups, crypto assets and venture capital in the blockchain sector, known for its professionalism and international profile. BlockVC systematically established the investment philosophy of “one-to-two market linkage” and created a proprietary investment matrix. The investment direction covers the basic public chain, general agreement and financial services in the blockchain ecosystem, providing full life-cycle services from investment incubation to asset management for blockchain projects, all of which have global impact. Support us, you will not only get the return of node rewards, but also the priority support of BlockVC’s overall strategic layout and service matrix. Not only will you get material rewards, but you will also get priority access to a full range of asset management services and support that will ensure you survive in a bear market and skyrocket in the next bull market. Supporting BlockVC is not only about rewards, but also an opportunity for the future success that you deserve to have. Founded in 2016 and headquartered in Singapore, LinkVC is a cutting-edge venture capital fund with global perspectives, including blockchain technology, cryptocurrency and financial technology. IOST Bean is operated by the well-known incubator Spark Blockchain and is headquartered in Boston. Spark Blockchain is dedicated to incubating blockchain solutions and blockchain application startups. IOST Bean is based in Boston, one of the world’s education hot spots and talent capital in United States. In the past, many high-quality large-scale blockchain summits have been held in the United States, attracting over 10,000 people to participate. Spark Blockchain runs the GXChain public node GXBean (top 11, board member), EOS super node EOS Bean and Tron super representative TronBoston. Spark Blockchain team members have extensive community governance experience, are members of the BitShares Core Team, and are active in the GXChain core governance community. The public chain with high-quality applications is a good public chain, so the developer community of Spark Blockchain can help IOST grow! IOST Fans is an ecosystem community that follows the IOST blockchain. IOST Fans provides a wealth of services for the IOST community including newsletters, IOST event previews, developments, project team and DAPP introductions and IOST node election and interviews. All information about IOST can be discovered through IOST Fans. Are you a fan of IOST? Then join IOST Fans! SSSminex is the IOST node jointly applied by SSSnodes and Minex.HK. It will become a blockchain resource and provide community advantage in Shenzhen and Hong Kong, and will build a high quality and stable IOST node. Shenzhen Super Node Block Chain Co., Ltd. (SSSnodes) is a technology company specializing in blockchain industry chain services. Providing complete technical services such as planning, technology landing, compliance, promotion, rating, channels, mining pool, investment, capital, and quantification as well as providing professional solutions such as community operation and node campaign. SSSnodes is a consultant by Mr. Tian Fanjiang, founder of Lily.com, and Zhao Sheng, the founder of World Blockchain Conference (WBF). Minex.HK is a Hong Kong company founded in 2017 dedicated to the promotion and development of blockchain services. A team of cryptocurrency experts consisting of blockchain analysts, marketing managers and more. In addition, they have close relationships with Chinese blockchain developers and various media companies, giving an unparalleled advantage in blockchain services. SSSminex will support the concept of IOST, safeguard the rights of IOST, build a node ecosystem that stabilizes the security and share benefits, join us and welcome the arrival of the blockchain spring! How to become an IOST node? Applications for IOST Candidate Nodes has already opened and voting will commence in mid January. There is no limit on the number of Servi Nodes (block producers) on the IOST network and we encourage any and all interested parties to apply. No technical knowledge or skills are required and is highly profitable for those that can effectively market the IOST network and themselves as candidates. For Node application information see here.